1 What are meningitis and septicaemia? The following are possible symptoms of meningitis or septicaemia. Take note that not all symptoms may occur. Example, the classic symptoms of neck stiffness and rash will not occur. See below for other possible symptoms. If you suspect meningitis or septicaemia – Sick Professional help immediately. Meningitis is an inflammation of the lining that covers the brain and spinal cord (the meninges). It is usually caused by a bacterial or viral infection. Septicaemia is an infection of the blood with bacteria (blood poisoning). If bacteria multiply and release toxins (poisons) into the blood, it can can cause serious illness. Meningitis and septicaemia are separate diseases. However, the most common cause of bacterial meningitis (the meningococcus) often causes septicaemia at the same time. 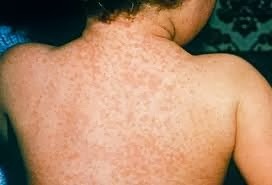 A typical rash is common with meningococcal infection. The rash is red or purple. Small spots develop at first and may occur in groups anywhere on the body. They often grow to become blotchy and look like little bruises. One or two may develop at first, but many may then appear in different parts of the body. The spots/blotches do not fade when pressed (unlike many other rashes). To check for this place a clear glass firmly on one of the spots or blotches. If the spot/blotch does not fade and you can still see it through the glass, get medical help immediately. The rash is a sign of septicaemia. 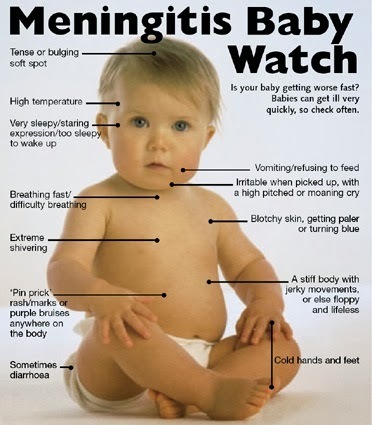 It may not occur with meningitis alone. 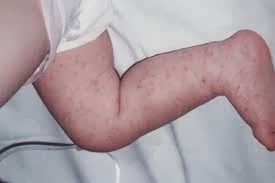 Note: a rash does not occur in all cases of meningitis and septicaemia but can be quite characteristic when it does occur. The symptoms often develop quickly, over a few hours or so. The symptoms can occur in any order, and not all may occur. Sometimes symptoms develop more slowly, over a few days. The symptoms may suggest a less serious illness at first. For example, fever, headaches, and vomiting are common with many viral illnesses such as flu. Therefore, even if you think it was flu to start with, if symptoms become worse then it may be meningitis or septicaemia. Many children who are developing meningitis or septicaemia have nonspecific symptoms such as just feeling or looking generally unwell. These symptoms may include having a high temperature, being more tired than usual and feeling sick. Leg pains – which can become severe and prevent a child from standing or walking. Cold hands or feet – even if the child has a high temperature. Excessive crying – often high-pitched or moaning and different to their usual cry. Fever – but the baby may not look hot and the skin may look pale or blotchy, or turn blue. The hands and feet may feel cold. The baby may shiver. Will not take feeds – sometimes repeated vomiting. Being irritable – especially when picked up and handled. Drowsiness or sleepiness – does not wake easily. A bulging fontanelle sometimes develops. The fontanelle is the soft spot on the baby’s head. Jerky movements may occur and the body may appear stiff. Sometimes the opposite occurs and the body appears quite floppy. Convulsions (fits) sometimes develop. Fever and shivering – however, the hands and feet often feel cold. Stiff neck – cannot bend the neck forward. Headache – which can become severe. Aches and pains in muscles or joints – the pains can become quite severe. Dislike of bright lights – will shut eyes and turn away from the light. Drowsiness or confusion – may appear vacant. Repeated vomiting. Sometimes abdominal pain and diarrhoea.